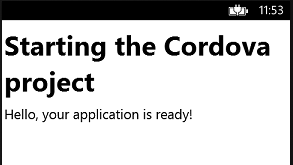 Last time out, I started a simple Cordova project. Having got the default project, it’s time to start making some changes. I should probably note that for some not very exciting reasons to do with where I am today and the dev machine to hand, I have used Visual Studio 2013 with Update 4 for this post. If, like me, you found that you cannot see the box on the right hand side, you can add the Solution Platforms drop down selector from the Add Or Remove Buttons menu. There are all the familiar Windows Phone Emulators as well as a selection of Android emulators – the simplest being the Ripple emulators that use Chrome to emulate Android. And remember there is a Visual Studio Android emulator that you an install and use, too. That’s a working – albeit not especially useful or impressive – app running on multiple platforms. Next time I will look at adding some functionality. It’s been a little while since I wrote on this blog. 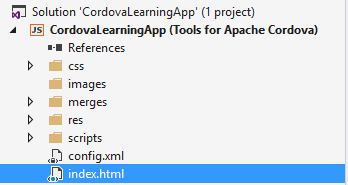 I’ve just started to get to know Apache Cordova, so I figure it’s in order to blow away the virtual dust and post occasional blog entries to document progress and keep notes. But first a quick side note: once I get some more momentum I will need a better name for this series of posts. 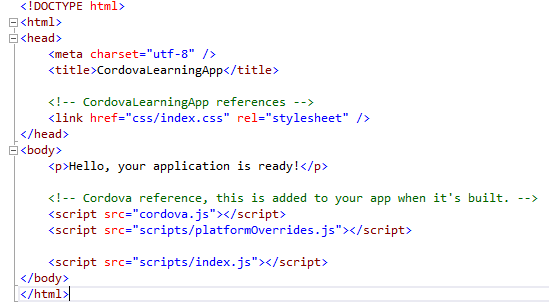 I have already rejected Cutting the Cordova and They Think It’s Cordova. Suggestions welcome.